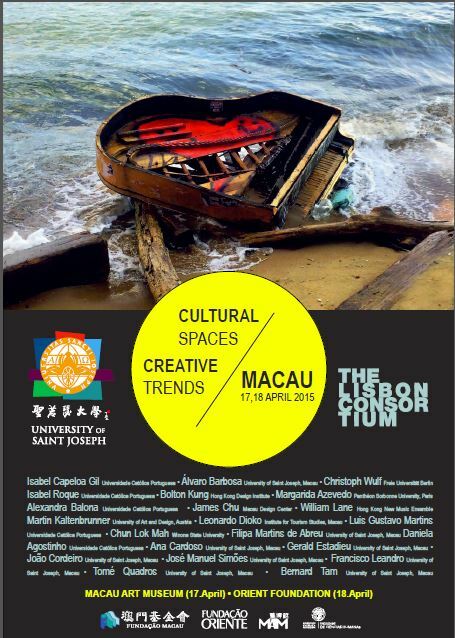 The Symposium on Creative Industries: Cultural Spaces / Creative Trends will take place on 17 and 18 April 2015 in the Auditorium of the Macau Art Museum and the Auditorium of the Orient Foundation, respectively. The Faculty of Creative Industries of the University of Saint Joseph, in collaboration with the Faculty of Human Science of the Catholic University of Portugal and the Lisbon Consortium network, is organizing a Symposium on Creative Industries, under the topic “Cultural Spaces / Creative Trends”. The event will take place on 17 and 18 April 2015 in the Auditorium of the Macau Art Museum and the Auditorium of the Orient Foundation, respectively. The panel of guest speakers is comprised of more than 20 experts, coming from different countries and professional backgrounds. Among the international speakers are Isabel Capeloa Gil, from Catholic University of Portugal, Christoph Wulf | Freie, from Berlin University and Martin Kaltenbrunner, from the Interface Culture Lab, University of Art and Design, Austria. Macau is represented by USJ faculty members and PhD students from the Faculty of Creative Industries, Leonardo Dioko – professor in IFT – and the designer and entrepreneur James Chu, from the Macau Design Center. In both days of the event closes with a musical performance dedicated to crossover genres, characterized by the use of new musical interfaces and abstract musical approaches.